I started a bonsai garden this weekend. It’s not really a garden, just a collection of five or six plants taken from a single japanese boxwood shrubbery with the intent of training to grow as bonsai. It was originally going to be a kind of meditation for me—slowly watching the plant grow, patiently waiting for new buds to sprout for trimming, marveling at the imperceptibly minor changes that build upon one another to resonate into a new twists and shapes in the bark over the years—but I’ve already become obsessed with it. I’ve been neurotically checking the plants every couple of hours, making sure they’re okay on water and unharmed by the wind, twiddling my thumbs until Saturday when I’ll finally know if the repotting has gone okay or not, when I’ll finally be able to begin trimming and shaping them. But it’s not entirely disquieting; I’m not yet suffering from any actual stress because of them, so that’s already a step ahead of every other ‘relaxing hobby’ I’ve tried. Regardless, here’s my first in a series of “Bonsai Diary” posts. Feel free to skip it altogether. Bonsai #1 is currently unnamed. He lives in a trapezoidal box of light blond wood (pine?). 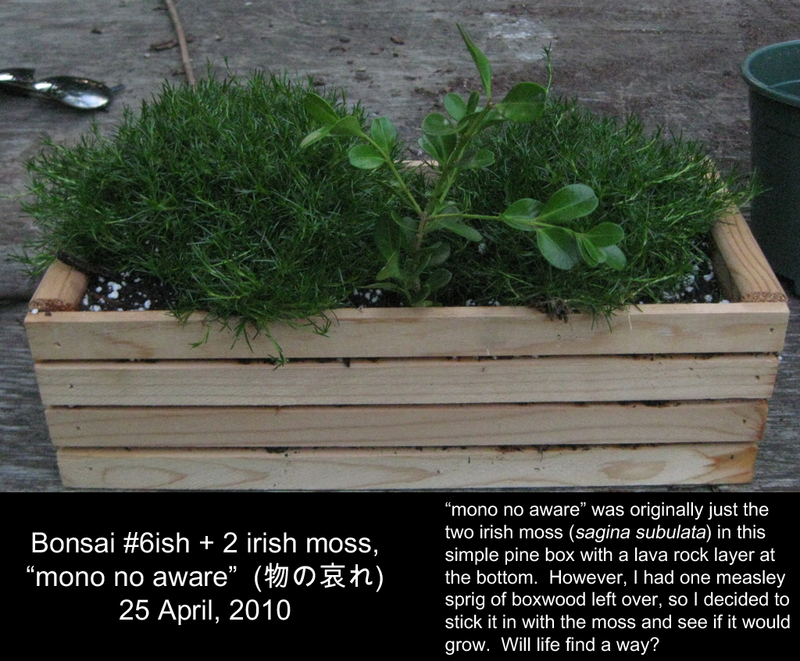 When I was separating the five root clumps of these bonsai from their initial medium shrubbery, I had some difficulty. As can be seen on Bonsai #1, I stripped the bark off a few of the trunks. 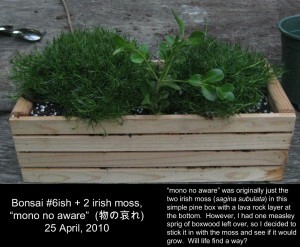 Bonsai #1 will be grown in the moyogi, “informal upright,” style. This shallow yellow dish is a bowl I got at Goodwill for $.99. There is a layer of tiny lava rocks at the bottom of the bowl for moisture absorption. 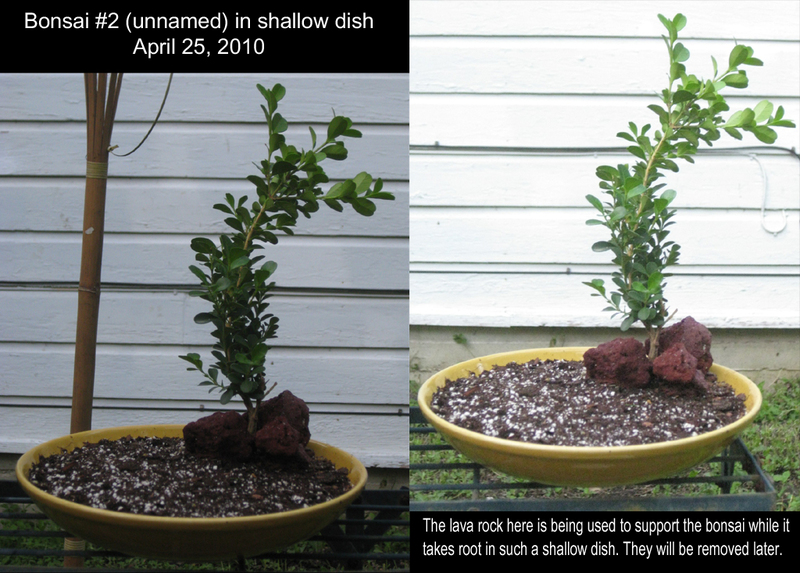 The large lava rocks on top of the dirt have only been placed in the dish to support this bonsai as it takes root in its shallow home. I had planned to remove the support rock as soon as possible, however, they’ve begun to grow on me. I think they complement the bowl nicely. 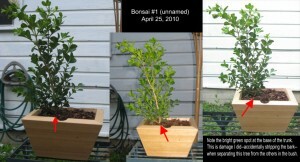 For Bonsai #2, I don’t intend to impose a style. He will be very ‘go-with-the-flow’ and suited to whatever I find most visually appealing for him. 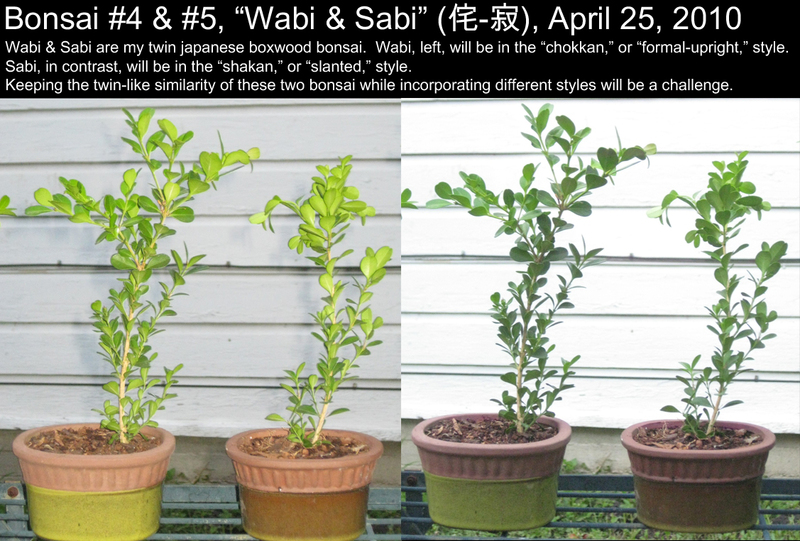 The final two bonsai, #5 & #6, “Wabi & Sabi,” are the true throw-aways of this garden. Even after I had decided to salvage Genji, Wabi & Sabi were headed straight for the mulch pile. 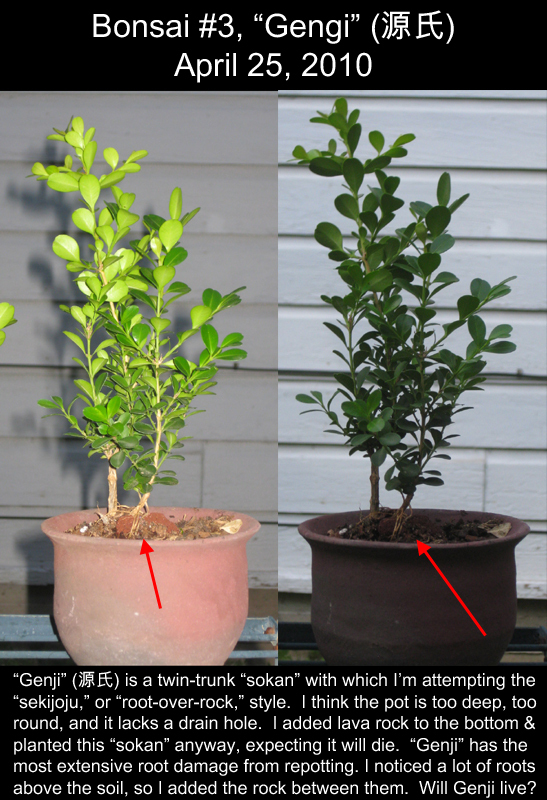 However, because their roots were strong and intact, and because not much damage was done to their trunks in the separation process, AND because they looked nice in the two nearly-matching ‘bonsai pots’ I had, I decided to plant them. 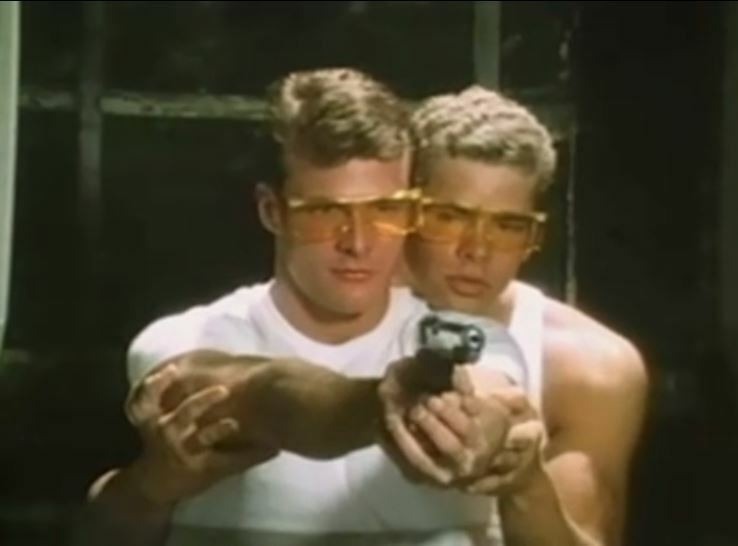 Strangely, while I have no expectations for Genji, I really want Wabi & Sabi to live. 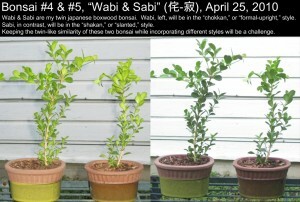 Wabi, in the yellow-green pot on the left, will be grown in a chokkan, or “formal-upright,” style. Because Wabi is already bending, it will take patience and skill to train him into a straight form. 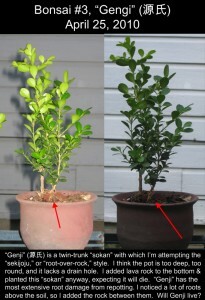 Sabi, in the brown-green pot on the right, however, will be grown in a shakan, or “slanted,” style. Maintaining the twin-ness of these two bonsai while still adhering to the two different growing styles will be a challenge. Links! 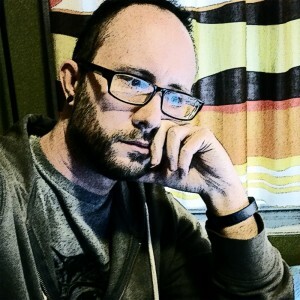 …or, perhaps for today’s post, Branches! Life After Ph.D. – Yet Another Webcomic, Thirty-Seven: Comedic Wabi-Sabi. 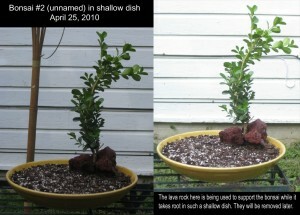 Bonsai Site, a website I’ve been using for much of my information on bonsai growing. Wikipedia entries on bonsai, mono no aware, wabi-sabi, and the japanese boxwood shrub. Why Bonsai, yet another website about bonsai… this one has excellent descriptions of the bonsai styles, alone with beautiful and simple sketches of each. And, finally, the Great Outdoors Nursery in Austin, Texas… the place I bought my Japanese Boxwood shrubbery from.